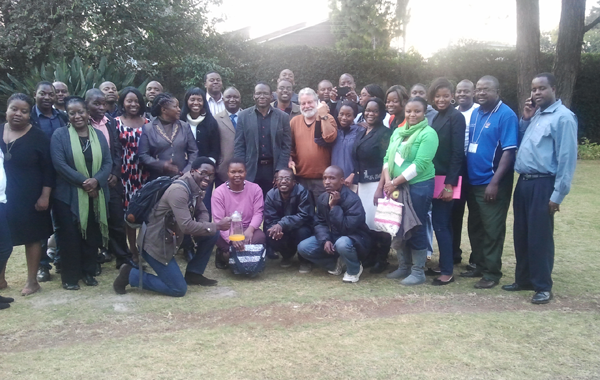 The above-mentioned workshop was co-hosted by the Biomedical Research and Training Institute (BRTI) and the African Institute of Biomedical Research and Training (AiBST) in Harare, Zimbabwe. The two institutions organized the workshop in collaboration with scientists from the Division of Infectious Diseases at Stanford University Medical Centre, CA, USA and Southern African Treatment Resistance Network (SATuRN). Thirty-one participants from various public and private academic institutions, diagnostic companies as well as the National Institute of Health Research and the National Microbiology Laboratory. The participants were drawn from various disciplines including Clinical Medicine, Biomedical Science, Public Health and Biostatistics. The aim of the workshop was to update the participants on the current trends in the application of molecular diagnostic tools in the diagnosis and monitoring of HIV/ AIDS and its co-morbidities in resource limited settings. The first day of the workshop started with a review of the emerging technologies in HIV and TB clinical diagnostics. This was followed by a session in which various CD4 testing technologies in Zimbabwe were discussed as well as viral load testing in resource limited settings. Local quality assurance programmes as well as quality assurance programmes for international clinical trials were also discussed. The afternoon of the first day was dedicated to opportunistic infections. New Point of Care diagnostics for Cryptococcal infections were discussed as well as the new WHO, IDSA and CDC recommendation for the assessment and treatment of CrAg+ meningitis. The day ended with discussions on the WHO and International regional recommendations for public health TB screening and treatment as well as a review of TB drug resistance, multi-drug resistance (MDR), extreme drug resistance (XDR) and Microscopic Observation of Drug Susceptibility (MODS). The second day of the workshop was dedicated to HIV drug resistance. It was started with a review of molecular biology and the principles of molecular techniques (PCR and Sanger based population sequencing). This was followed by a review of the HIV replication cycle emphasizing on the targets of for the currently registered antiretroviral drugs, the mechanism of action of the drugs as well as the mechanism of resistance. The morning theoretical sessions were followed by afternoon sessions of practical sequence data analysis including sequence assembly and sequence quality assessment. The drug resistance discussion continued on the third day with focus on HIV drug resistance interpretation algorithms and databases (HIVDB and SATuRN) as well as sequence quality assurance tools such as phylogenetics and the sequence quality assessment tool (www.bioafrica.net). The implication of the pMTCT options adopted by Zimbabwe (B+) on drug resistance was also discussed as well as the current trends in drug resistance from the WHO ResNet Studies. This day was concluded with discussions on alternative to sequencing for drug resistance such as the OLA as well as data from the Affordable Resistance Testing for Africa (ART-A) consortium on their affordable viral load and genotyping assays. The last day of the workshop focused discussion of data from various implementation studies. These ranged from the implementation of rapid HIV testing and point of care test for HIV monitoring to pediatric and adolescent HIV diagnostics and management. Treatment as prevention and pre-exposure prophylaxis issues were also discussed as well as future regimens in the context of Zimbabwe's capability to access new drugs being developed and registered for the management of HIV. The last talk of the workshop highlighted the relationships between infectious diseases in epidemic and human security.